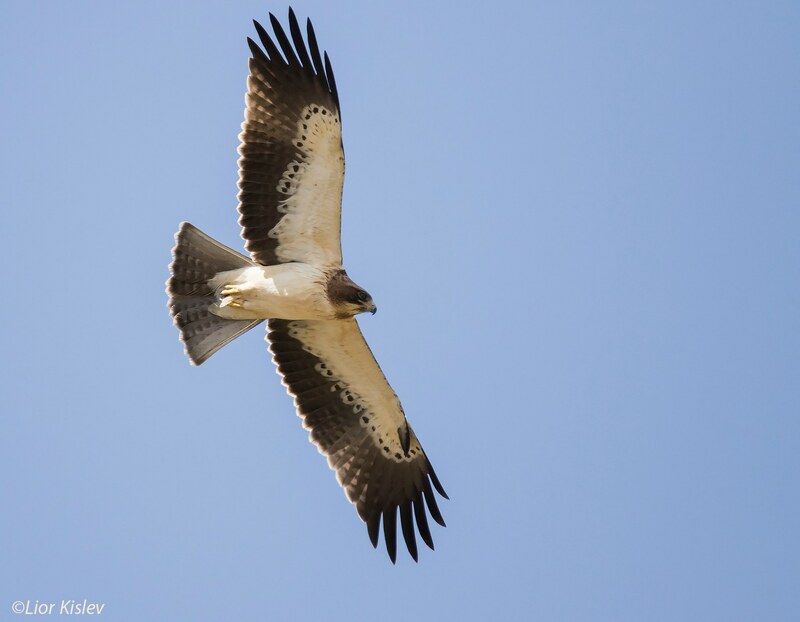 One thing that fascinates me about Israel’s nature is the rich diversity of birds, particularly the Old World raptors – both resident and migratory species. 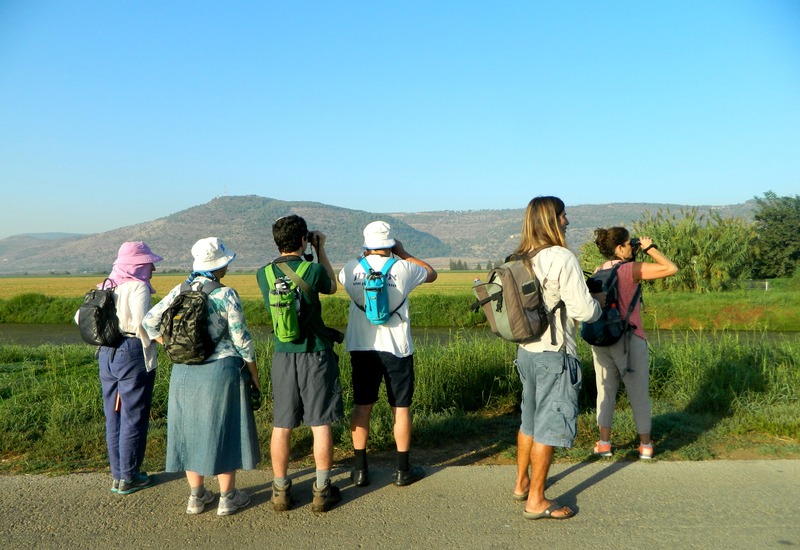 One Friday several weeks ago I seized the opportunity to go on a birding tour in one of the world’s best bird-watching locations, the Hula Valley. Leaving the house shortly after 5am I drove the dark mountain roads heading east and saw the early stages of daybreak just after passing Tzfat. 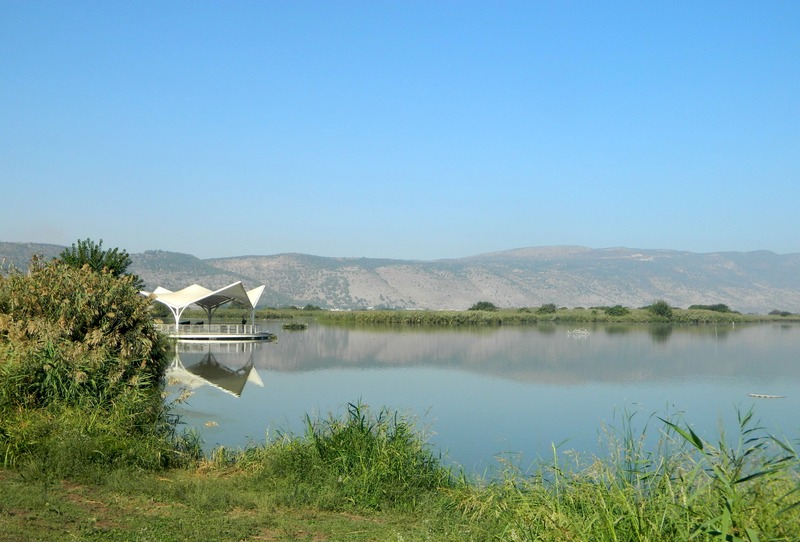 I reached Agamon Hula, a KKL park, and prayed in the parking lot before meeting up with my tour guide, Lior Kislev. A popular birder, Lior’s website has helped me several times with bird identification and it was a joy to meet him at last. We entered the park with a few of the other tour members (including Yedidya Popper, a protégé of Lior who graciously shared photos with me for this post) and, equipped with binoculars, began with the barn swallows resting on electrical wires just outside the visitors centre. Nearly immediately thereafter we were launched into full-scale raptor watching with a whole bunch of greater spotted eagles, black kites, black shouldered kites, marsh harriers and others who were flying about and resting on the side-roll irrigation system frame. We walked along the trail stopping now and then to watch aerial turf battles and the occasional hooded crow mobbing. At one point, while our collective eyes were pointed skywards watching the predatory commotion, I heard a loud squeak at my feet which was identified as a social vole – hide little fella! 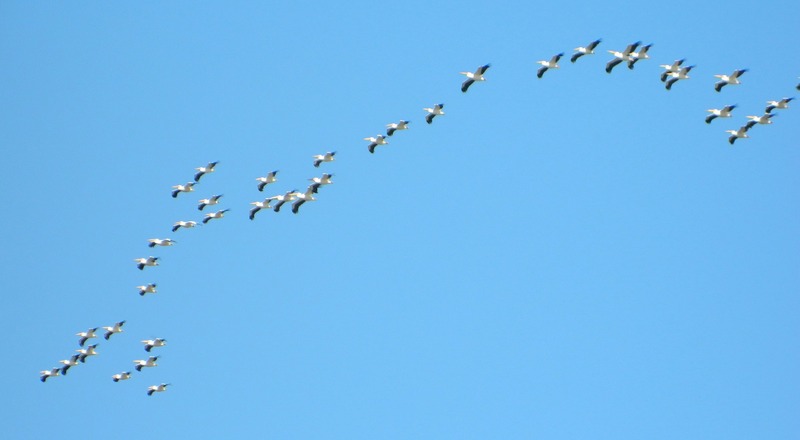 During all this time, and for most of the tour, there was a steady flow of large migrating birds flying overhead including white pelicans, spoonbills (which I was very excited to see) and, of course, common cranes. I had always associated Hula Valley’s migration season with the cranes that are so heavily talked about but with an experienced ornithologist at hand, I came to understand that the cranes were just a very small part in the overall bird-watching experience. We stopped for breakfast at a picnic table, frequently interrupted by raptor activity on the other side of the Jordan River or by warblers (of which we spotted four species) and a beautiful bluethroat or two flitting among the reeds. In addition to the birds, there were several resident nutrias – an invasive rodent from South America. 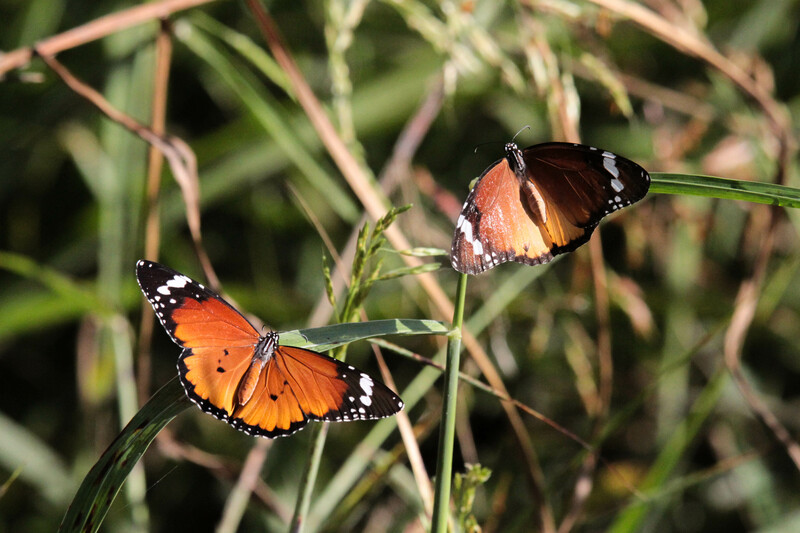 In terms of migratory species, also the African monarch butterfly makes its way through the Hula Valley and we saw tons of them. As we walked closer to the bodies of water, someone called out “black francolin” and we watched as the elusive gamebird dashed into the undergrowth. As we walked along the water’s edge we saw a good number of passerines including red-throated pipits, whinchats, larks and some species of the predatory shrikes – a bird that has interested me since childhood. Before long we were able to peer through the reeds at the numerous species of waterfowl and waders including grey and little herons, ibises, coots, moorhens and more. We arrived at the first platformed observatory where we met a Peruvian governor and his wife on a VIP tour of the nature park and then spied on something that excited me immensely – greater flamingos. 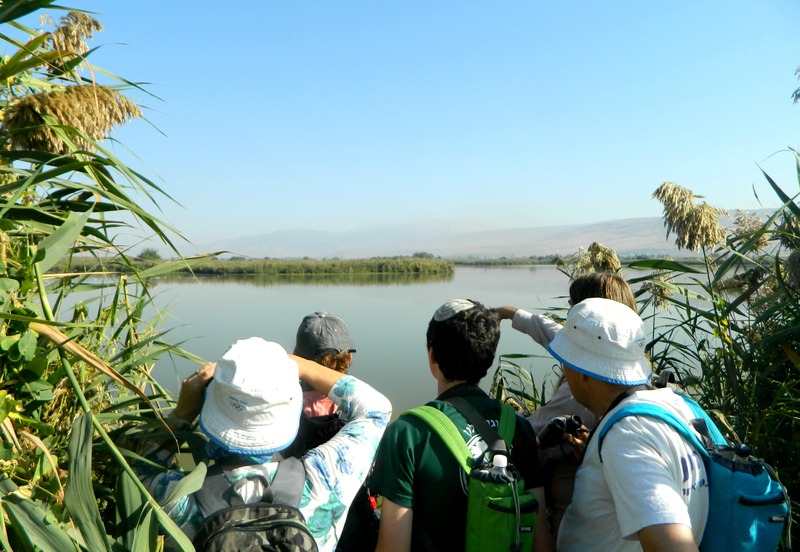 Even while we watched the cormorants, common snipes, stilts, avocets and more in the shallow waters Lior would frequently direct our attention to the sky where soaring raptors circled overhead. 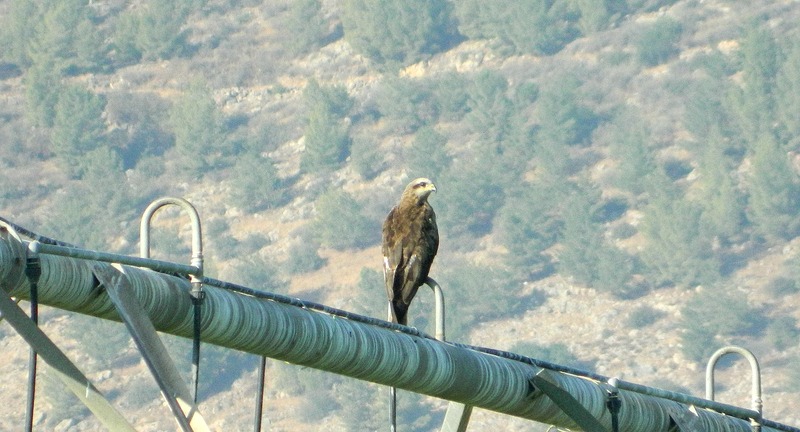 It was during one of these sudden sightings that we saw something uncharacteristic – an immense griffon vulture was visible way out to the east. A bird with incredible range, and truly immense wings (boasting a 2.3–2.8 m (7.5–9.2 ft) wingspan), this particular vulture was likely searching for food over the nearby Golan plateau where they nest (see Gamla). Reluctantly we left the observatory and continued on, stopping at a grassy area to lay on our backs watching the black storks, black kites and booted eagles wheeling above us while we snacked on fresh almonds and cookies. Along the trail up ahead we found two catfish that had been seized from their watery hole and were mysteriously untouched. We passed caspian turtles and a squacco heron before reaching the observatory most visitors are familiar with. Being as that we wanted to see all that there was to offer, we took the 11-km trail that loops around the lake in its entirety – not the path most traveled. With one or two water buffalo off in the distance, we watched a small muddy pond packed with mallards, shovelers and common teals; a lone black kite circling ominously nearby. 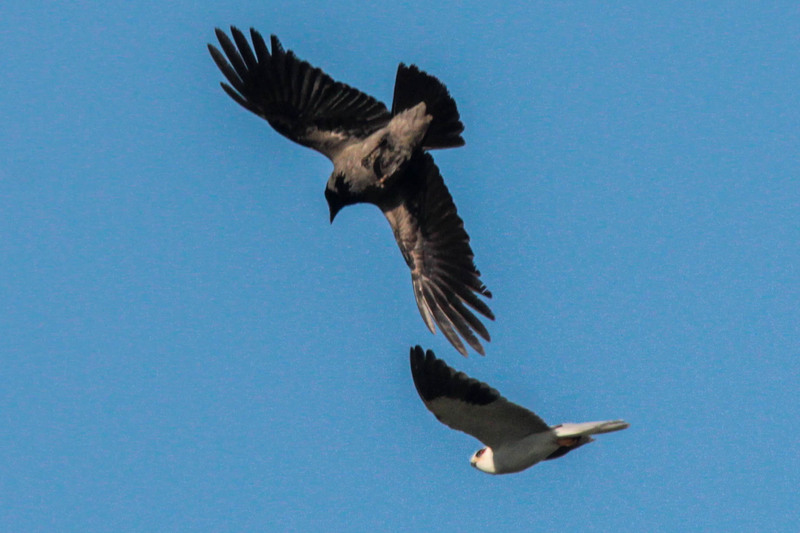 Suddenly the waterfowl exploded into the air, the sound of hundreds of wings beating, and we scoured the area for that black kite – perhaps he had succeeded in nabbing one for lunch. Finally on the home stretch, we walked and talked, pausing to discuss self-combusting peat which was a problem in the park several years ago. 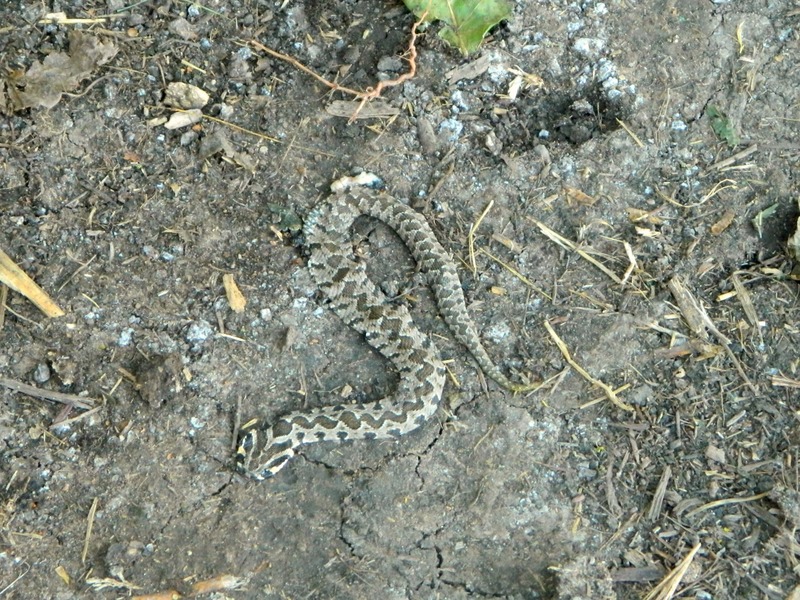 Shortly before we reached the visitors centre Lior showed us a dead young viper which looks to have been crushed – I have yet to see a living viper in the wild. Back at the visitor centre we sat down with pen and paper to make a list of all the birds we had seen that morning. All in all, over the course of five or so hours, we succeeded in spotting 72 species of birds, far more that I would have ever imagined. I highly recommend taking this tour to all those who read this blog – it’s truly a treat! Finishing off my day trip to the Gilboa and Bet Shean regions was a stopover at Israel’s best-preserved Crusader castle, Belvoir (or Kochav HaYarden, in Hebrew). 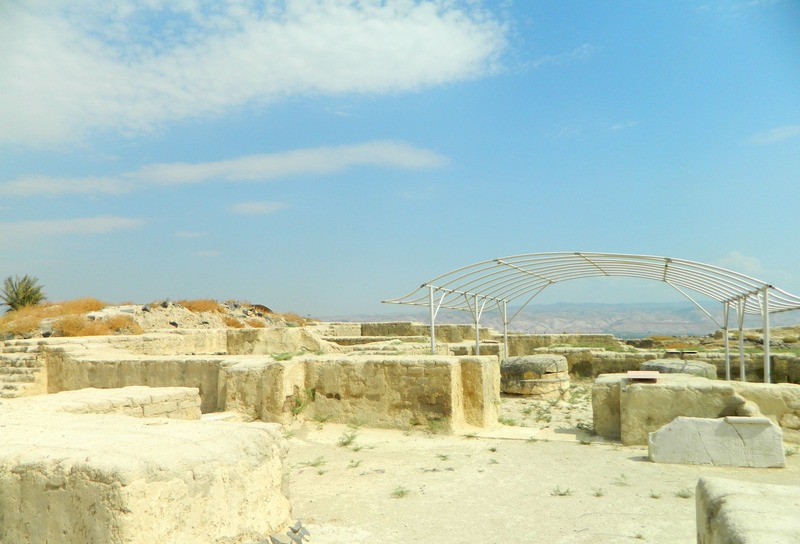 Located just ten kilometres north of ancient Bet Shean, this Crusader fortress stood on an escarpment overlooking the Jordan River Valley – a seemingly impenetrable bastion. From Road 90, running parallel to the Jordan River, I drove up the single-lane access road that meandered its merry way up the mountainside. I entered the park and began what I thought would be a circular path to the castle, but I soon reached a closed gate with a view of the low mountains to the north and the seasonal Tavor stream. Turning around, I walked the short direct trail to the bluff’s edge passing a sculpture garden featuring the work of Yigal Tumarkin. The name Belvoir means “beautiful view” in French and they were’t lying when they named the castle – the view is phenomenal. The suggested path for visitors starts at the main gate at the southeastern corner of the castle, leading past the once-heavily fortified barbican (now mostly in ruin). From there the route leads into the outer courtyard passing the corner towers and the cistern where water was stored, being as such there was no spring in the immediate vicinity. One thing that’s particularly beautiful about Belvoir is the symmetry used to build a succession of fortified structures, culminating in the small keep at the western end. The history of Belvoir is rather brief beginning in 1140 as a fortified farmhouse owned by the Velos family and sold to the Knights Hospitallers in 1168 who, in turn, built the castle as we know it. In 1182-83 Belvoir was besieged by the Ayyubid sultan Saladin, the bane of the Crusaders, although the siege was a failure. Not intending to give up, Saladin returned with his army in 1187 after defeating the Crusader at the Horns of Hattin and laid siege once again. 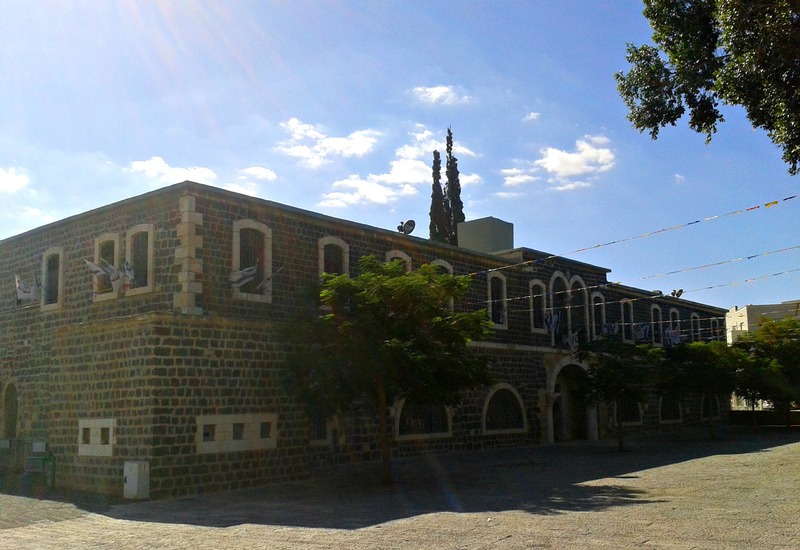 After two years the sultan’s sappers succeeded in undermining the barbican and the Hospitaller knights negotiated a truce in which they were afforded safe passage to Tyre, in modern day Lebanon. 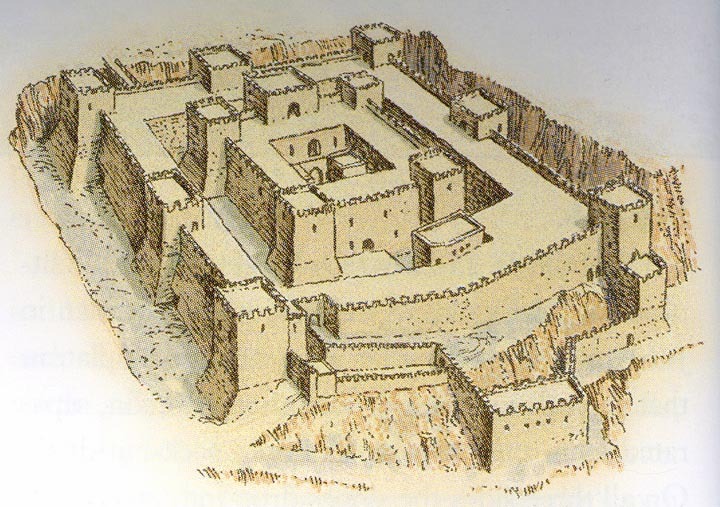 Frightened that the Crusaders would somehow return to occupy Belvoir, Saladin had it partially destroyed. 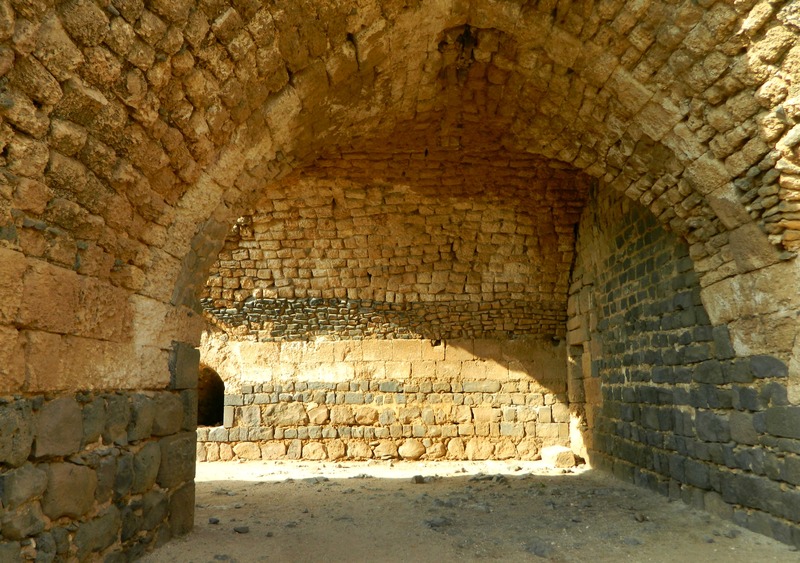 The sultan’s fears were justifiable as the Crusaders did return in 1241 and, upon seeing the ruins, abandoned the castle, leaving it definitely. 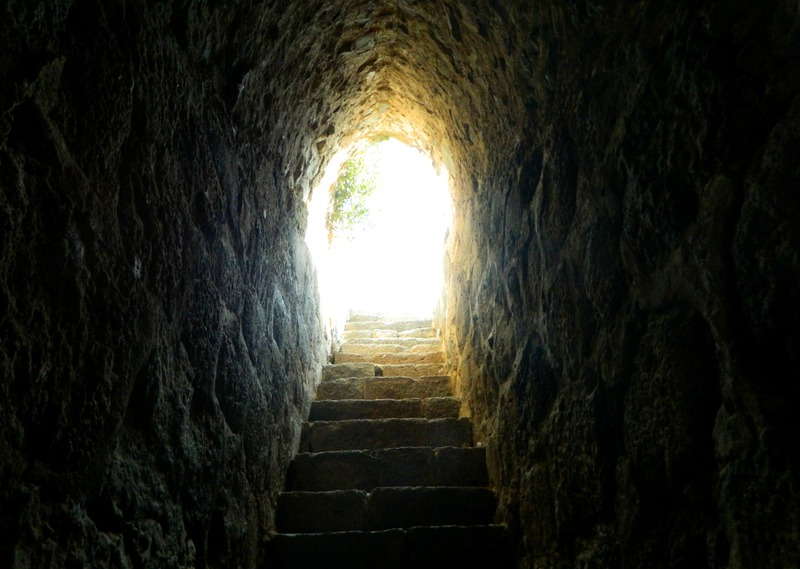 Walking into the inner fortress, I passed through the arched gateways of the keep (also known as a donjon in French). Inside the inner fortress I found the kitchens, dining hall and refectory as well as other smaller courtyards, accented by the four corner towers. The trio of ovens are of a very interesting design and I can almost recreate a scene in my mind where the bland European foods of wild boar and coarse bread were cooked up for the great feast in the nearby dining hall. The special laundry basin, also located in the inner fortress, has an interesting lining of broken pottery bits, reminding me of the clay piping in Montfort Castle, the Teutonic Knights’ mountaintop headquarters. Outside the keep is the west gate where a drawbridge once stood, spanning the deep dry moat that was carved out of the basalt mountaintop. 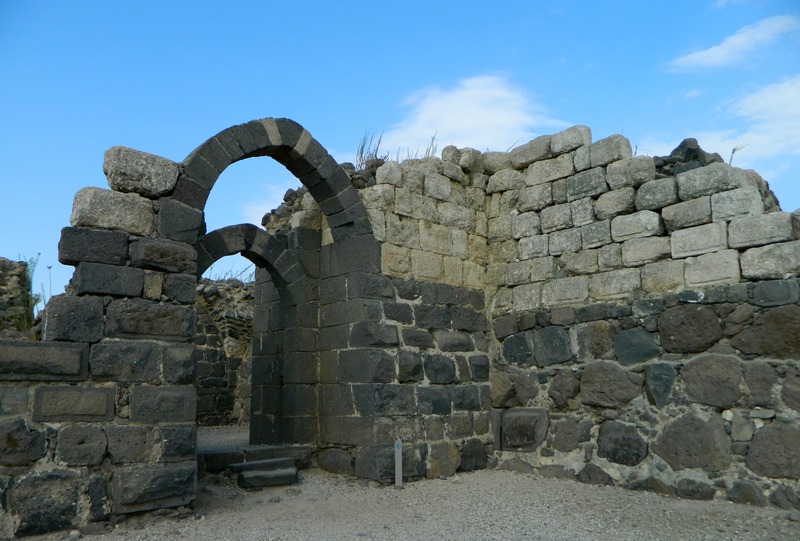 Interestingly enough, the castle’s construction was completed with both the local black basalt and a yellow-white limestone that was brought in – in fact there is a carved stone from an ancient synagogue that was recycled in an arched window. Before crossing the drawbridge, I followed the suggested route down a sally port (secret exit) in the southwest corner tower. Down in the moat I was able to look up and imagine myself as an invader attempting entry into a seemingly impenetrable behemoth of stacked ashlars. I reentered the castle via another sally port located in the central western tower. Crossing over the fixed metal drawbridge, I spotted two chukars (a type of partridge) on the far end of the moat and then headed for a small visitors’ centre of sorts where several curiosities are on display. 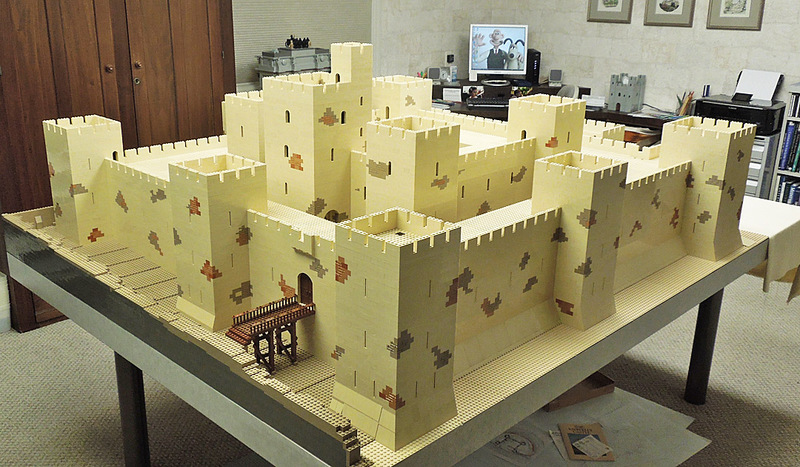 While researching Belvoir online I came across something magnificent, a Lego reconstruction of the castle created by the lauded Lego castle builder Bob Carney. If you haven’t seen his work, you should definitely check out his site where he has nearly 150 real castles built out of Lego and properly documented (I linked the full Belvoir page in the photo caption below). You can see a stop motion video of Bob’s recreation of the medieval Rhuddlan Castle in Wales on YouTube (HERE). Wrapping up my visit to Belvoir, I drove back down the meandering mountain road, scouring the roadside for gazelles and hyenas (of which I saw neither), until I reached Road 90 once again. 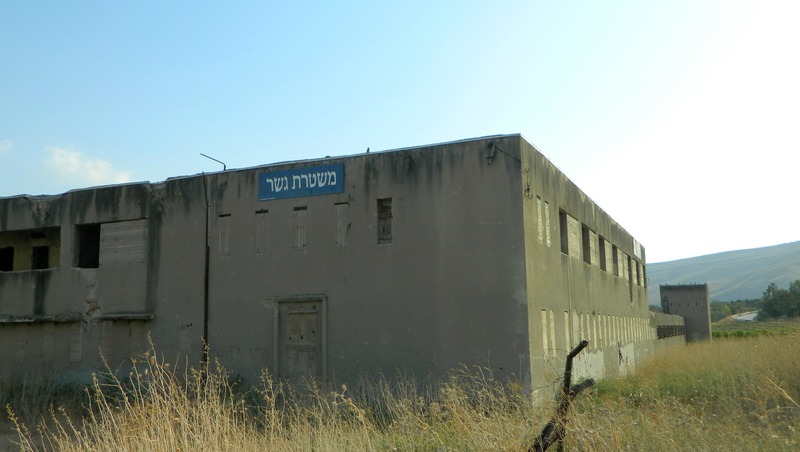 I turned north and stopped off at Old Gesher (Naharayim) where I first found an old British police station (yet another Tegart fort) which has since been pockmarked by bullets from a battle between Israeli and Iraqi forces in 1948. 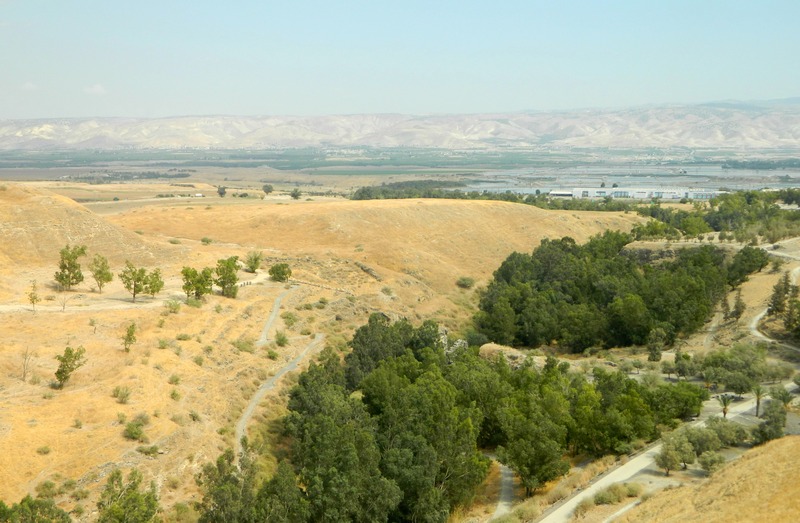 I drove closer to the Jordan River but it was soon apparent that the site was already closed for the day and I would simply have to return another time. Heading back to Road 90 I continued north to my final stop before heading home, Tel Bet Yerach – a remarkable archaeological site which I neglected to mention when covering Jethro’s Cairn, as they both concern the same pagan deity. 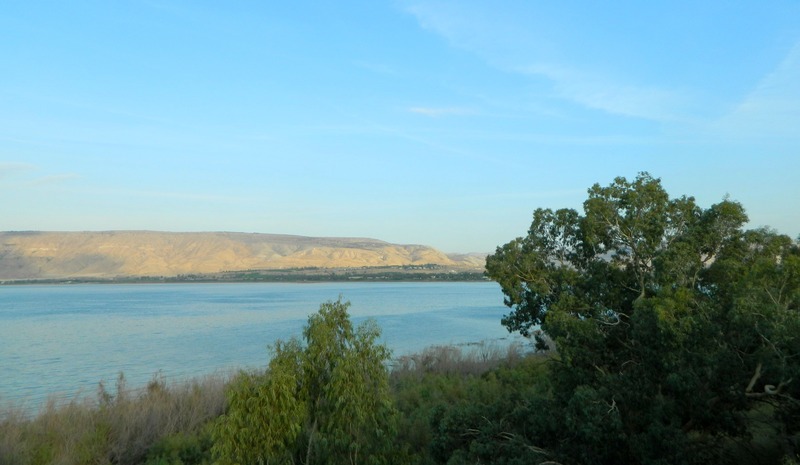 The tel is located on the southwestern banks of the Kinneret (Sea of Galilee), right at the southern mouth of the Jordan River. Unfortunately I was not completely sure where this site was so I estimated in planning and eventually realised that I was located on a plateau somewhere above it with no easy way down. So I relented and just took the time to enjoy the view as the sun slowly began to set over my shoulder, content with seeing all that I had succeeded in seeing, but ever eager to explore some more. 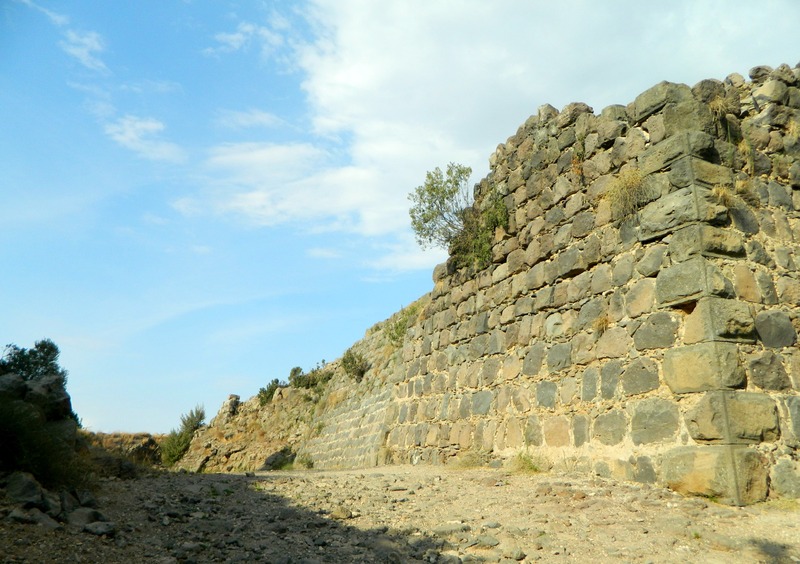 Continuing on with my trip that covered thus far the Gilboa Hot Air Balloon Festival and Beit Shturman and Beit Alpha, I left the base of Mount Gilboa and drove into the city of Bet Shean. 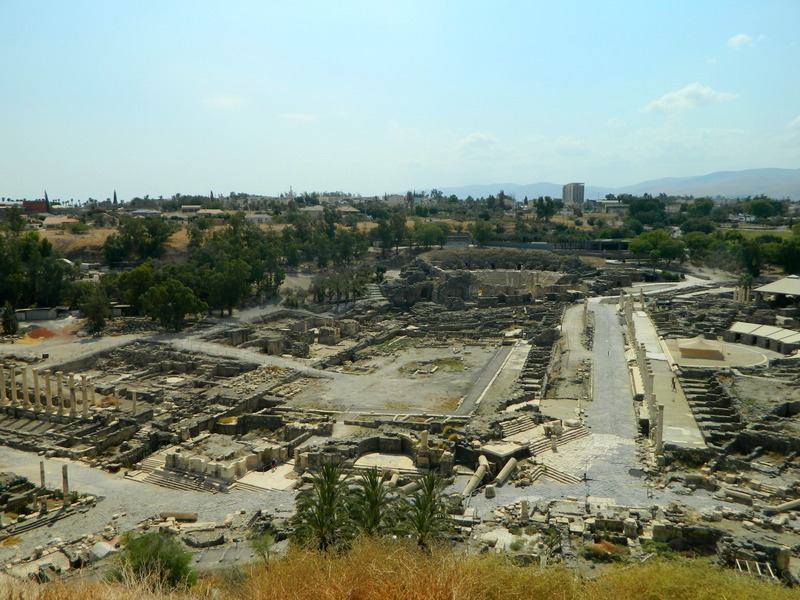 I was headed for the national park which holds the ruins of ancient Bet Shean (or Scythopolis, as it was known in Roman times). Entering the park, I was absolutely overwhelmed by the magnitude of the ruins uncovered and on display- how have I taken so long to visit? Having to consult the visitor guide’s map to decipher the endless rows of broken structures, I began with the iconic Roman theatre. 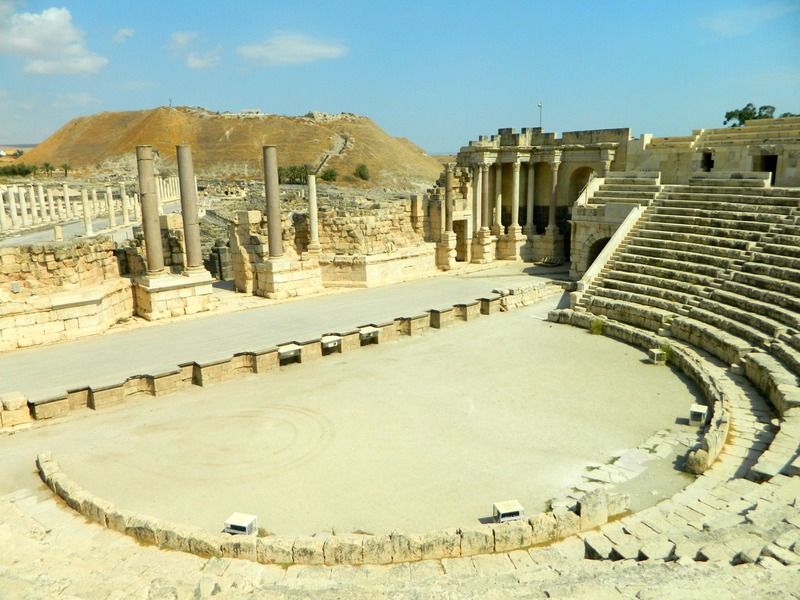 Built to seat some 7,000 spectators, the half circle rows of limestone benches face the stage which, during Roman times, was backed by a twenty metre-high scaenae frons, an elaborately decorated background which usually rose to the height of the ceiling. 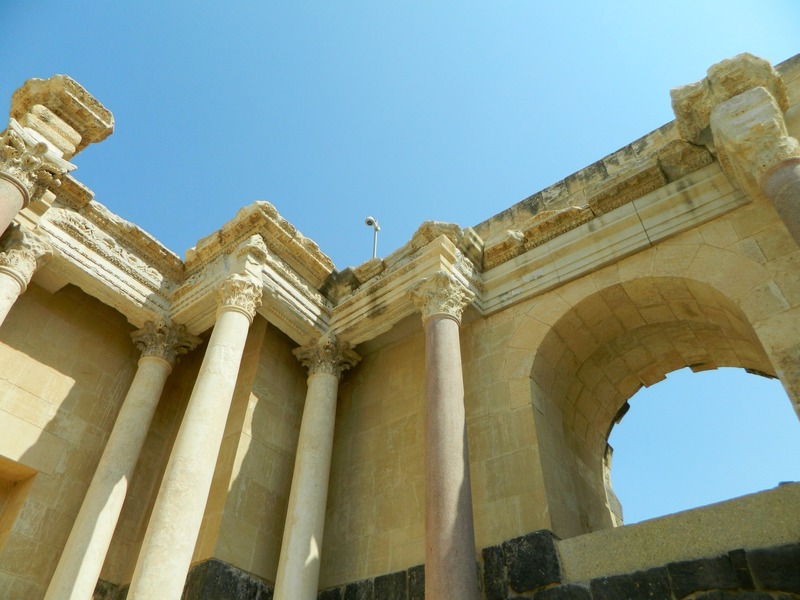 In the case of this particular ruin, the scaenae frons was mostly destroyed, as well as the upper rows of seats, so renovations are taking place to recreate the theatre to its original glory. Leaving the theatre, I next explored the vast bathhouse which covers some 9,000 square metres of prime real estate. As in most large Roman cities, the bathhouse was a central public building where citizens would come to exercise, bathe and socialise. One thing that I noticed was the intricate mosaic work even in the large rooms, where simple floor tiles would have been easier. Another thing was the revolutionary hypocaust, an underfloor heating method which warmed the floor and the room itself. 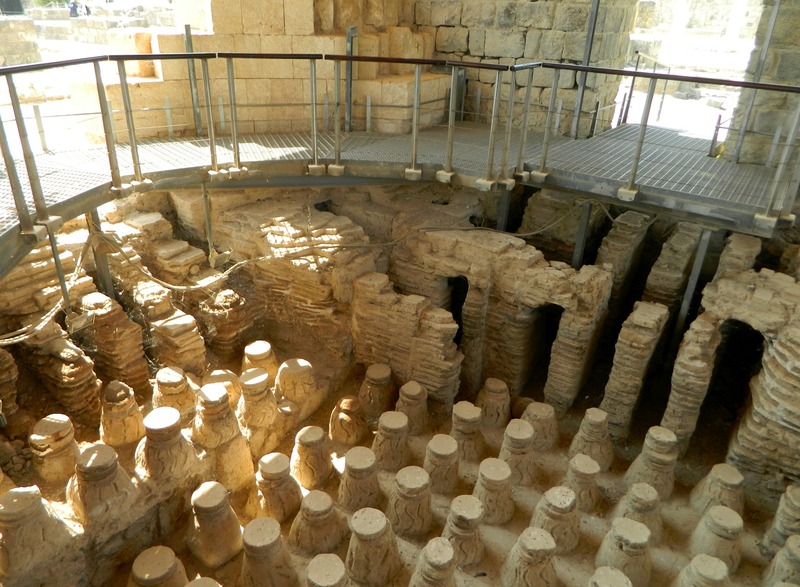 I had seen the same construction in a small Byzantine bathhouse outside the mountaintop ruins of Avdat in the Negev, and here the technology was explained in full. Leaving the bathhouse complex I began my walk down Palladius Street, a colonnaded road of large white columns dividing the bathhouse and “sigma” from the Byzantine agora. 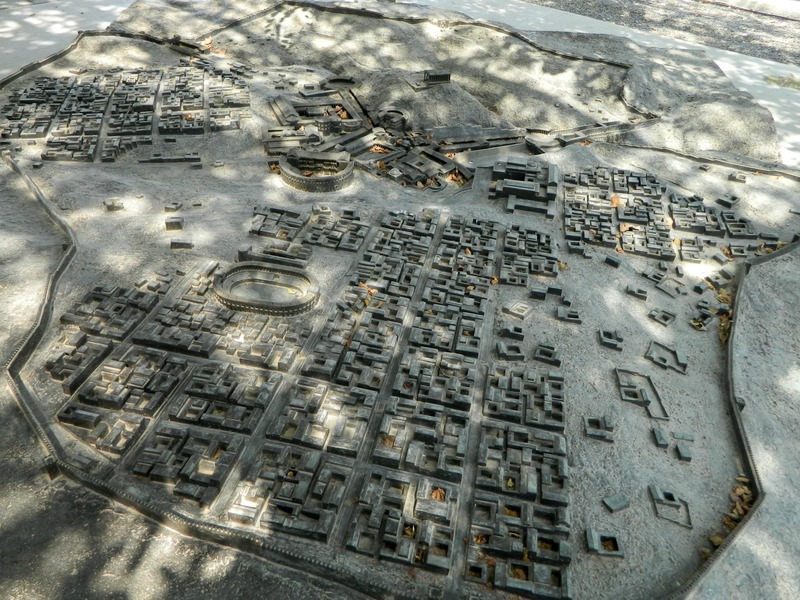 I paused to take a look at the sigma, a semicircular concourse lined with small mosaic-floored rooms – including one with a medallion of Tyche, the city’s guardian goddess. Crossing the street, I looked at the agora which is relatively unadorned, having served as a commercial centre during those times. Continuing along the main road, I reached the junction between the Northern Street and the continuation of the city’s nucleus to the east. It seems as though the excavators and renovators have given up on the Northern Street, as it is absolutely littered with ancient rubble, including large building chunks and broken pillars. 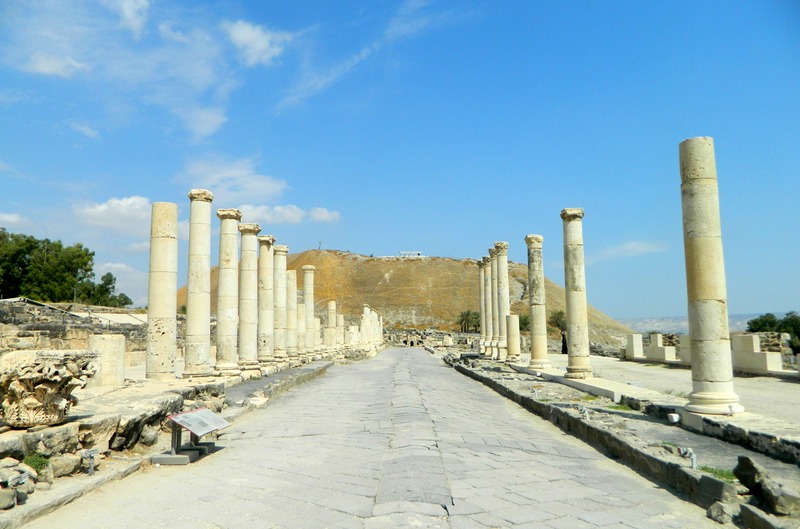 So I focused my attention on identifying the numerous structures before me, including the Roman Temple and Nymphaeum, an ornate public fountain. It was about now, standing amid a chaotic collection of crumbled construction, that I realised I had made a grievous error not bringing any water along. The midday summer sun that permeates the valley was starting to dry me out. I wrapped my button-down shirt around my head and shoulders and forced myself to continue onwards. I walked along the Valley Street which leads to the northern end of the city, but I was headed not north, but up. 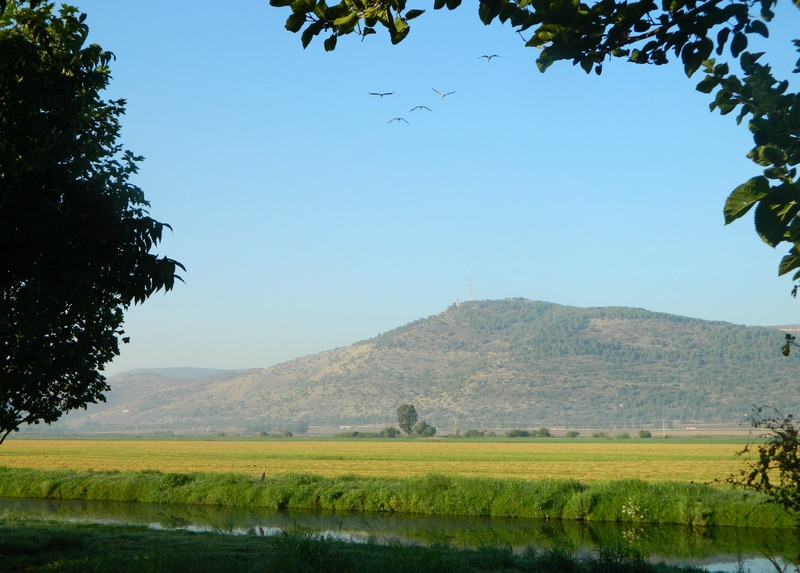 Standing at the base of the tel (archaeological mound), I began my conquest of the harsh yellow hill. The stairs going up were tough indeed, but at the very top was a view that really captured the magnificence of the city sprawl down below. However, it was only the Romans who occupied the ruined area, previous civilisations inhabited the summit of the hill, with their subsequent constructions one atop the other – a stratum of ancient foundations. 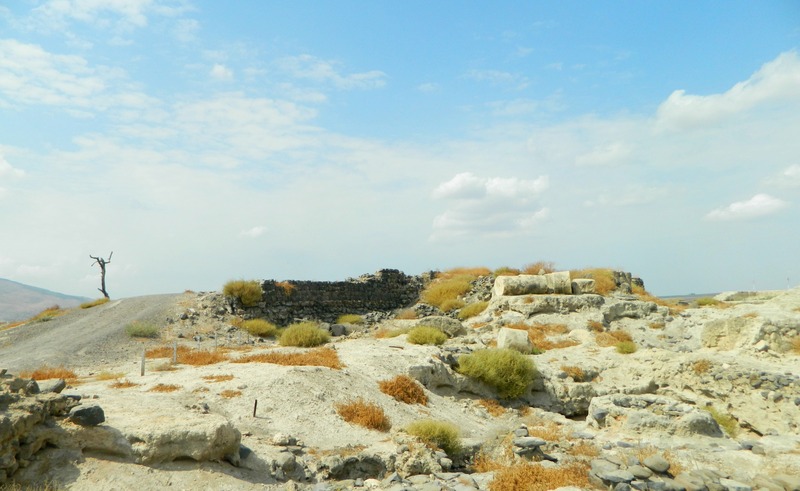 Nearly as prolific as the glorious tel of Megiddo, some twenty layers have been uncovered at Bet Shean, including those of Jewish rule. It was at a lookout with an audio guide that I found a stout water fountain – the fountain of life for my parched lips. Drinking desperately from the weak flow of warm water, I listened to the tender voice informing me of the place I was kneeling upon, and the surrounding view. Following the trail, I saw a good number of ancient walls from Canaanite and Egyptian occupation, including the Egyptian governor Ramses-Weser-Khepesh’s palace with an uncovered stone lintel depicting him kneeling before his master, Pharaoh Ramses III, in hieroglyphics. If that’s not interesting, I don’t know what is. 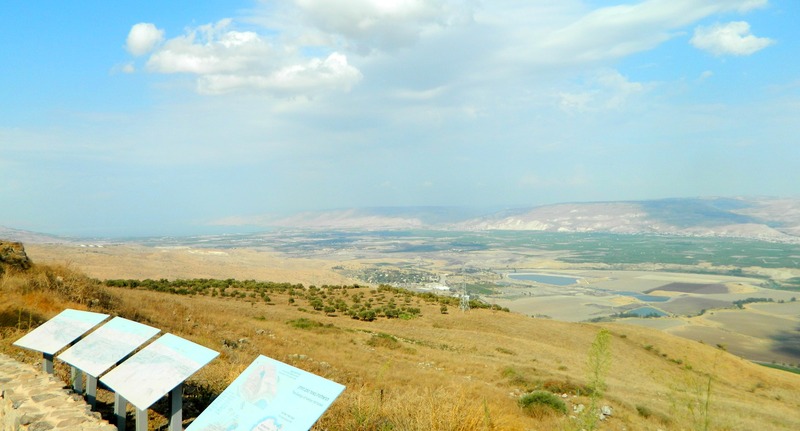 Perhaps of greater interest is the Biblical story of King Shaul, when he and his sons were killed in battle with the Philistines at nearby Mount Gilboa, and were brought to Bet Shean to dangle from the city walls as trophies. On a lighter note, to the north of the tel is Nachal Harod and the churning water can be both seen and heard way down below. A ruined Roman bridge is also visible, as well as the ruins of several Byzantine churches on the opposing hillside. Passing the numerous excavated temples, fortresses and various buildings, I came to a lone skeleton of a tree, supported by rusted metal against the stark stone ground. It reminded me of a particularly absurd play/film called Waiting for Godot, which I was made to watch in high school. Trotting back down the hill, I swung eastward, walking down Silvanus Street which is similarly colonnaded. When the street ended and a dirt path began, I passed another bathhouse and then public lavatories that serviced the theatre and bathhouse visitors. Just beyond that I found a cultic compound with an assortments of altars and similar structures amid a temple. I then re-entered the magnificent theatre where I began my tour of the ancient city and made my way back up to the visitor centre to watch a short film about the city in general in the comfort of shade and strong air-conditioning. Without too much time to lose, I decided to skip the Roman amphitheatre (oval as opposed to the mostly circular theatre) and the nearby Crusader/Ottoman fortress and other Ottoman buildings, uncharacteristic as that may be. I had stumbled upon the fortress two years ago while driving through the city with my army truck and didn’t see anything of extreme interest. Plus, time was not on my side and I still had a few more places I wanted to visit including the Crusader castle of Belvoir just a few kilometres northward.